Britain’s biggest water companies have paid out £1 billion in dividends to shareholders this year instead of using the money to fix leaky pipes or cutting bills for customers. Analysis by The Mail on Sunday shows the top nine water suppliers lavished their shareholders – mostly large City institutions and overseas investors – with vast sums ahead of a crackdown by the watchdog Ofwat. Water companies have been criticised by both the Conservative and Labour parties for overcharging customers and for wasting 840 million gallons of water a day through leaks – enough to meet the needs of 22 million customers. Labour leader Jeremy Corbyn has outlined plans to renationalise the sector while Environment Secretary Michael Gove has attacked the firms for paying large bonuses and high dividends. Ofwat is currently reviewing customer pricing and dividend payments are under intense scrutiny. This year there was a £1 billion dividend bonanza. The largest single payment was £180.6 million by United Utilities in early August, first revealed by this newspaper in July. The company also paid shareholders – which include American investment giant BlackRock – £90.3 million in February. The £180.6 million dividend proved controversial as it came just two days before a proposed hosepipe ban was set to be introduced across the North West of England. The company eventually decided against imposing the ban. On Tuesday, Pennon, which owns South West Water, paid shareholders £112 million, following a £50 million payout in April. 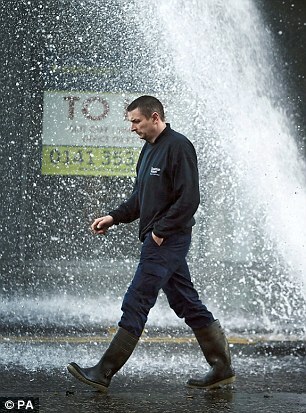 Severn Trent, the other main listed water company, handed out £123 million in July and £82 million in January. Thames Water decided to suspend dividend payments and halted bonuses for bosses this year after Ofwat criticised it for failing to tackle leaks. Last week, companies submitted to the regulator their plans for customer charges between 2020 and 2025. Ofwat will publish its initial assessments of the proposals in January with its final decisions due in December 2019. United Utilities and Severn Trent said they would cut bills by 10.5 per cent and 5 per cent respectively over the period in real terms. Thames Water said it would keep bills flat but invest £11.7 billion in upgrading infrastructure, which will help to reduce leaks. Pennon suggested giving away shares to its 800,000 customers but critics pointed out that these would be worth an average of just £25 per household. Professor David Hall, a water industry expert at the University of Greenwich, is sceptical about whether the industry review will result in significant cuts to customer bills. ‘Unless the system is torn up and is recreated – which Ofwat itself can’t do – it’s hard to see any significant changes,’ Hall said.